Several Houdini rarities sold in Potter & Potter's Winter Magic Auction on December 3. 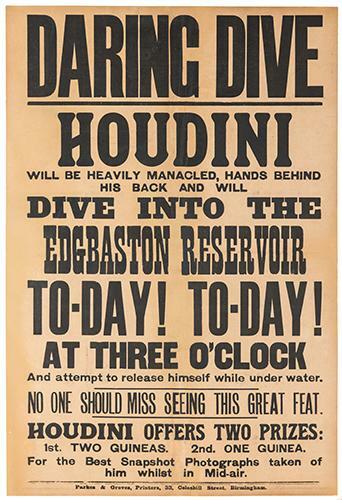 Among them was a nice broadside advertising Houdini's jump into the Edgbaston Reservoir in Birmingham, England on December 15, 1908. What I especially like here is that Houdini offered cash prizes for the best photographs "taken of him whilst in mid-air." This went for $5,658. Other lots of note included an antique pair of Palmer Handcuffs from Houdini's collection ($3,936); a copy of the rare 1927 Russian book "Harry Houdini – Debunker of Spiritualists" ($2,460); a colorful 1908 Christmas card ($3,936); and an invitation to Houdini's Shelton pool test ($1,045). Potter & Potter's next auction is the highly anticipated "The Golden Age of Magic Posters, Part II" on February 4th, 2017. That auction will include Houdini posters. Would have loved that Edgbaston poster. Too much in the end. Local newspaper reports of the jump and HH's Hippodrome appearance that week has a sentence stating "Winson Green defied"
This local prison still exists today but I believe it was a sanatorium in the past. Still looking into this. I couldn't believe the postcard advertisement for Houdini at the Cleveland Palace went for $750 (plus buyers fee). I bought the Houdini Hippodrome (Cleveland) program last year and got into a bidding war. Seems like there are at least a few of us Houdini nuts from Cleveland! The postcard advertising Houdini went for a lot but I have never seen one before. But the Shelton pool test was something to have, wish I had the nerve to bid that much. Potter had some good stuff I liked it much better than Haversat. I was eying that Shelton invite as well. Would love to have one of those. But I kinda want one that's filled out with the invitees name. One that was actually used. 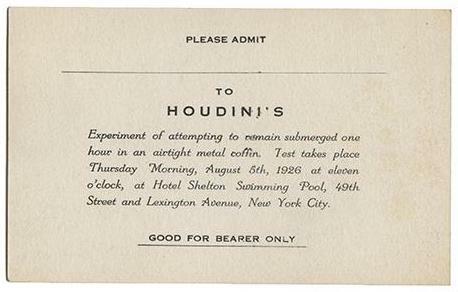 I agree the Shelton pool card is awesome, wonder how many Houdini released? I see there is now a 25% buyer's premium from Potter Ouch! Still can find good deals on ebay. 25%? I thought it was 20%. Might be 25% for online? There is a 25% premium on LiveAuctioneers, Invaluable, and Ebay; 23% on Bidsquare; and 20% in-house (this includes absentee and phone bidding as well as floor bids). I often wonder why some of the advertisements/posters go for more in some cases than an actual letter signed by Houdini. I would think something Houdini touched would fetch much more than an ad/poster that Houdini may have never seen. Is it because a given letter may not look authentic? Some posters may be from blocks away from a showing or maybe not even used? I'd appreciate any thoughts/ideas on this. I paid a lot for a Houdini program, but that was because I assume it was distributed at one of his actual shows, so there is a connection to the show itself. There are a lot of Houdini letters out there, not as many posters (damn few in fact). With letters, a lot has to do with the content, stationary, timeframe, etc. You can be a little choosy wth letters. Now a poster or a broadside signed or annotated by Houdini, now your talking rare and selling for big bucks. Good luck getting one of those. But I agree Potter may not be the best place to sell your collection, Haversat may be a bit more fair of a place to move your collection even though they seem to be stuck in the stone age or ebay. You also could post it with John??? Haversat & Ewing stuck in the stone age? Their buyer's fee is a low 17% and they don't charge extra for using Paypal or credit cards. Since this is unheard of in current magic auctions, I suppose that H & E is caught in a time warp. Also H/Es format is one you never see either, maybe BC. The problem with most auctions including Potter and Potter is you have to be there at the last second or you will almost always get snipped out. Some auction systems like the one Haversat uses allows the auction to be extended if sniping happens. It can with some systems be extended an hour or even a day or more with each new last minute snip until it ends, which is much fairer to both the buyer and seller. This advantage should be used more often. Haversat has the lowest commission rate and does some sniper prevention but by far not enough. I will tend to bid more if I know the auction house is not charging me too much for a seller's fee. So that 15% or 17% commission is very desirable. I love posters, and if you are bidding 10K++ on a poster, no need to charge someone 25% . The % should be based on the amount of the final bid. I've never won on a tying bid and I have placed my bids weeks in advance online. It seems that the individual bidding in person or perhaps via phone takes precedence over the online bidder. I have also been burned once or twice on an item description. I try to study the catalog photo as closely as possible. I am not above using my magnifying glass to get better details from the photo. Descriptions can go both ways. Sometimes they don't know exactly what they have. I'll never forget how a Butterfield auction described a set of tin cups for the cups and balls. Didn't sell for that much. I was with the buyer when he received it. He smiled and assembled the "cups"...into Houdini's spirit trumpet! Yeah John that's is appreciated but regular buyers have many more stories of not getting what we thought, and being burned when we thought we won. I would say that was a while ago, when was the Butterfield auction?? I only wish a seller would give a description as if they were buying it, not trying to hide something , or for whatever reason. Magic auctions have given me the opportunity to own magic that had previously been impossible to locate. So the glass is also half full. No, seriously. I just won Patrick Culliton's Houdini Unlocked on the last Potter auction, and at a good price. Do you know how difficult it is to find this set of books? The last set I saw on eBay went up for twice the price. Auctions are a game you have to learn to play. It isn't easy and the element of risk and losing is certainly there. Yeah but what you paid is about all there worth anymore try and sell them for more on ebay, won't happen. Go's back to what we said you pay alot to have the opportunity to have something very rare and hope when the time comes to move it, you can make a buck or two, or leave it the auction house to rob you again a second time... It's only money? ?